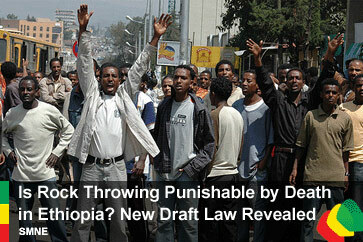 Is Rock Throwing Punishable by Death in Ethiopia? What next? Will rock throwing now become punishable by death? The same EPRDF government of Prime Minister Meles Zenawi that recently passed the draconian Society and Charity Proclamation law, that severely restricts worthwhile activities within Ethiopian civic society, is hard at work again. This time the focus is on anti-terrorism. This is truly ironic since this same regime has been accused of genocide, crimes against humanity and war crimes against its own people and the people of Somalia, acts that meet the definitions of terrorism according to their own newly drafted anti-terrorism law. Most Ethiopians consider the greatest threat of terrorism as coming from their own government under the control of Mr. Meles Zenawi and his supporters rather than from outsiders. The Solidarity Movement for a New Ethiopia (SMNE) recently received a copy of a draft of the Federal Democratic Republic of Ethiopia’s (FDRE) “Anti-Terrorism Proclamation” from a source not wanting to be identified. Please read the Anti-terrorism Law (pdf). According to one of the individual who help draft “Anti-Terrorism Proclamation” Ethiopians public has not seen it yet. This law, if passed, threatens violators with penalties of death or up to 15 years in prison for terroristic acts, which in itself, may not seem to be out of line for extreme cases; however, the history of this regime is that such laws are manipulated to repress, intimidate and eliminate opponents. Ethiopians know what this means. To outsiders, the bill may appear to be innocuous, but to insiders, they know that it will be used to intimidate and to suppress dissent. The Meles regime has become masterful at using the words of democracy—“justice”, “the rule of law”, “the protection of the people” and “the upholding the Ethiopian Constitution”, as tools of tyranny. Because there is essentially no rule of law in Ethiopia, minor infractions can be inflated into serious ones, ill-defined laws can be tailored to justify what are actually politically-motivated charges and the innocent can be targeted with trumped up charges. When such cases are actually heard in court, the outcomes can be pre-determined by a biased court system under the firm control of the ruling party. Ask people like Ms. Birtukan Mideksa, Mr. Teddy Afro, Ms. Lalise Wodojo (a justice-loving sister from our Oromo people), Mr. Bashir Makhtal, (brother from Ogaden region and a Canadian citizen who has been held without trial for the last two years in Ethiopia and the countless other prisoners of conscience being held in prisons, jails and detention centers across Ethiopia! The current draft of this newly proposed anti-terrorism law has many vague areas—probably on purpose. For example, one of the definitions of terrorism includes “government or public intimidation” that “creates risk to the safety or health of the public.” This is punishable by death or up to 15 years in prison. What does this mean? Speaking out against the government? Organizing an opposition party? Peacefully demonstrating against a flawed election? Throwing a rock? Standing in a crowd with someone else throwing a rock? As one can see, this definition could easily be twisted or exaggerated into meaning just about anything under a regime where the only consistent “rule of law” is impunity for privileged violators. Here is a government trying to portray an opposite image of itself rather than what is the reality for nearly 80 million Ethiopians living in the country. Lies usually eventually catch up with those telling them and this is what has happened over the last several weeks starting when Meles was at the G-20. In the past, agents of the vast Ethiopian propaganda machine, from Meles to the government controlled media outlets, have defied the facts, time and time again, creating an illusionary world that does not exist. From years of fine-tuned practice, with straight faces and hardened consciences, they present denials, assertions and convoluted facts based on anything but the “straight” story; however, their ability to maintain these distortions with outsiders is now breaking apart as truth exposes the shameful practices of this TPLF regime to the world. In the last few weeks, an incredible turn around as been brought about as EPRDF government spin is being confronted with conflicting facts from numerous and unanticipated sources. Is this an indication that Meles’ support within the international community is collapsing? Is the TPLF coming to an end? For instance, a few weeks ago, a major economic conference, led by the Economist magazine, was cancelled at the last minute, allegedly because the information would have exposed the dishonest portrayal of the economic situation in Ethiopia. Last week, officials from the World Bank publicly challenged Meles’ claims that the economy was growing by 11.2%; instead, they projected levels to be no more than 6.5 %. When Meles was in the UK for the G-20 and under fire regarding human rights abuses, at the last moment he cancelled a press conference where some suspected he would be grilled about the abysmal state of human rights in Ethiopia. Why would the leader of a country run away from the media unless he had something to hide? He also might have found it embarrassing to answer such questions as the head of the New Partnership for Africa’s Development (NEPAD) since one of NEPAD’s primary goals is good governance and is an important part of soliciting foreign aid. Questions regarding genocide would not bode well; however, one wonders how effective this organization is in advancing its goals because of choosing leaders such as Meles who operates in such contradiction to the stated goals of NEPAD. If one checks the website for NEPAD, it appears that it has not even been updated for the last two or three years. Additionally, now Newsweek has come out with a viewpoint on Ethiopia that strongly challenges the spin thrust forward by the EPRDF government of Meles. Challenges to Meles’ portrayal of Ethiopia are multiplying and will be causing new problems for this regime. When Dr. Gregory Stanton, the president of Genocide Watch, recently called for an investigation of Ethiopian government human rights crimes from the UN High Commissioner for Human Rights, indicating that the killing of the Anuak met the definition of genocide, what was the government’s reaction? Woindimu Asamnew, the spokesman for the Ethiopian Embassy in Washington DC, was quoted in a Voice of America article by James Butty, posted on 4/15/2009, as saying, “We don’t take seriously their allegations and fabrications. They are totally unfounded, fabricated lies.” If it was “totally unfounded”, why did the African Union’s High Commission for Human and Peoples’ Rights accept this Anuak case in 2007? When the Anuak Justice Council, with the outstanding legal assistance from the American Human Rights Clinic in Washington D.C, presented the case of the Anuak, with extensive documentation obtained through multiple investigations, to the African Union’s High Commission for Human and Peoples’ Rights, it was accepted. To be accepted, the burden of proof is high, not only for evidence pointing to the perpetration of human rights crimes, but also to establish justification for hearing the case outside the country, which essentially means proving that local remedies had failed. All these democratic values and God-given principles—calling us to love others, respect humanity and to care for others—have been violated in Ethiopia. Up until recently, much of these abuses were carried out in the dark, but as the truth is exposed, covering up these abusive acts will become less and less possible. This is what is now happening. The last three weeks have revealed the lies to the public and the reactions of Meles and others within the regime are showing how fearful they are of public exposure of the truth. This is what the Solidarity Movement for a New Ethiopia intends to continue to do. It is our goal to not only identify the perpetrators and their violations, but to also make sure that these violators have no place to hide in western countries and that they will be brought to justice no matter how long it takes. We have begun to see that this government is not as mighty as people have thought. As Meles ran away from the media coverage in the UK, he failed not only the country, but also Africa. He may have taken over Ethiopia with guns, but there is something more frightening to him than guns—facing the truth and the ICC. That fear of accountability and exposure explains the rationale behind the proposed law, which is to find new means to continue to suppress the truth and punish resisters. This also explains the irrational application of the Ethiopian Constitution in the imprisonment of Birtukan and other political prisoners and why the Unity for Democracy and Justice (UDJ) opposition party could not get a license to hold a peaceful march in Addis Ababa from their office headquarters to the parliament building. Due to the widespread discontent within the capital city, such a rally could start with 200 people and end up with 200,000 or even 2000,000 as it happened in 2005. When Genocide Watch president Dr. Gregory Stanton said it was only a matter of time before Meles goes to the place behind bars where people who have committed these kinds of human rights crimes belong, it must have struck fear in his heart, for as the truth emerges about this regime, the flames of ethnic hatred and division he has kept going over his 18 years of authoritarian rule are dying down. His ability to maintain this fire is lessening and it may only take the gentlest of breezes to extinguish it. We do not know from which direction it will come—it could be from the North, South, East and West of Ethiopia or from a faraway land, but it will come and peace-loving people are looking forward to that day. One thing Meles and his supporters may not realize is that the Ethiopian Constitution and the proposed anti-terrorism laws that are being devised to entrap others may actually provide the very tools needed to overcome this brutal regime. This would be the best outcome—for the Ethiopian parliament and people to take a moral stand to uphold the law of the land. The following is only one example of how the hands, feet and head of the EPRDF could be later charged under this new law. Just today (4/15/09), in the Jimma Times, one can read about the EPRDF government harassment and intimidation of an Oromo student, Tasew Tabor Goobaa, who was recently expelled from Gondar University without any charges or wrongdoing other than being accused of having connections to the OLF. He was later abducted, also known as kidnapping. The dean of the school, a man named Muluken, was also suspected of being involved in his dismissal and final abduction. According to the new anti-terrorism law, if passed, the dean of Gondor University, the government forces involved in the intimidation and kidnapping (abduction) and those authorizing those actions, could all be held responsible for terrorism. iii. commits kidnapping or hostage taking…. This has been a year of firsts: Omar al-Bashir of Sudan is the first sitting president to be issued an arrest warrant for charges in violation of international human rights law. Alberto Fujimori of Peru is the first formerly elected president to be convicted of human rights crimes by national courts in his own country. Will Meles Zenawi be the first sitting prime minister to be convicted of genocide, crimes against humanity or war crimes by national courts in his own country while in office? Will the people of Ethiopia have the moral courage, strength, wisdom and wherewithal to use the legitimate rule of law to enforce the legitimate rule of law in Ethiopia? May God empower us and give us the strength and the wisdom to do our part in making truth and justice prevail in Ethiopia. May we prepare fertile ground by reaching out to embrace one another as we seek to repair our broken lives, our broken relationships, our broken villages, our broken laws and our broken country. Let us take heart in knowing that God can accomplish far more than we can ever ask or imagine and that He rewards those who seek Him. Even though Meles and those in powerful positions in Ethiopia and throughout the world may abandon Ethiopia, as long as we truly seek God, and put our “humanity before our ethnicity,” He will never abandon Ethiopia and its precious and beloved people.